We celebrate Easter with extended family, each bringing along some food, morning tea, salad and/or dessert and my Dad usually cooks a huge salmon on the BBQ. I’m usually asked to bring something sweet. 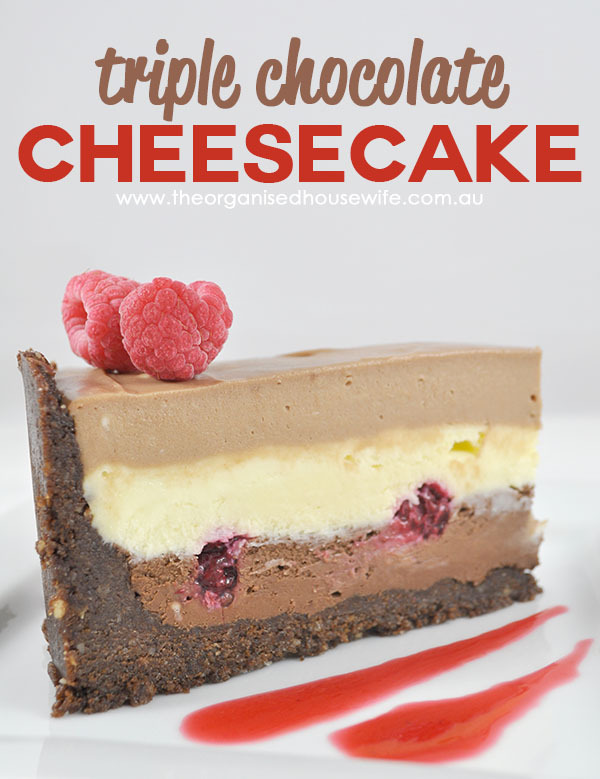 Last year Miss 12 made a Triple Chocolate Cheesecake from My Kitchen Rules, it was absolutely delicious and healthy too!! 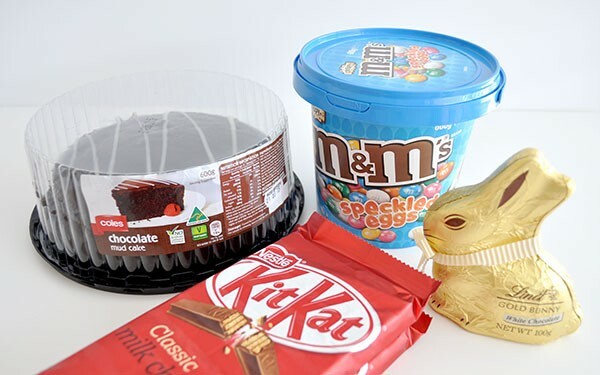 A great Easter morning tea idea would be an Easter Kit Kat Cake. It’s so simple and can be assembled within 15 minutes, give or take your perfectionism. You can have all these ingredients in your pantry/fridge a week or two ahead and then assemble the morning you need it. 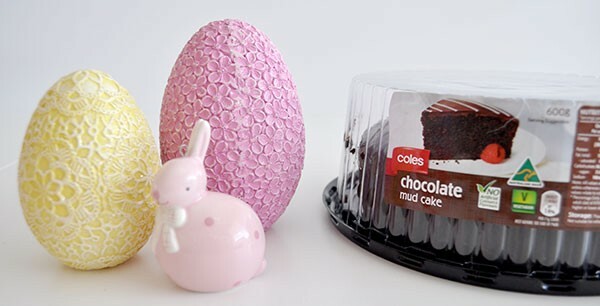 You can make your own cake if you wish, but we love the Coles Mud cake (so moist and muddy) and using a premade one makes preparing this cake effortless. I left the mud cake out of the fridge for a few hours, which melted the icing enough for me to smooth down the sides after removing the paper wrapping. This will allow the Kit Kat’s to stick easily around the side of the cake. 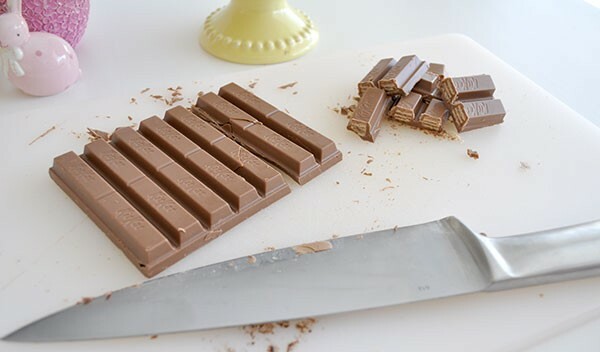 If you keep the Kit Kat’s in the fridge allow them to come to room temperature slightly before slicing, this will prevent them from breaking/snapping. Slice so you have two fingers together, I cut down the Kit Kat’s at the end of the ‘t’ on Kat, as I found the whole finger is too long. 3 packets of Kit Kat’s perfectly fit around the cake so no sneaking a finger as you need them all! 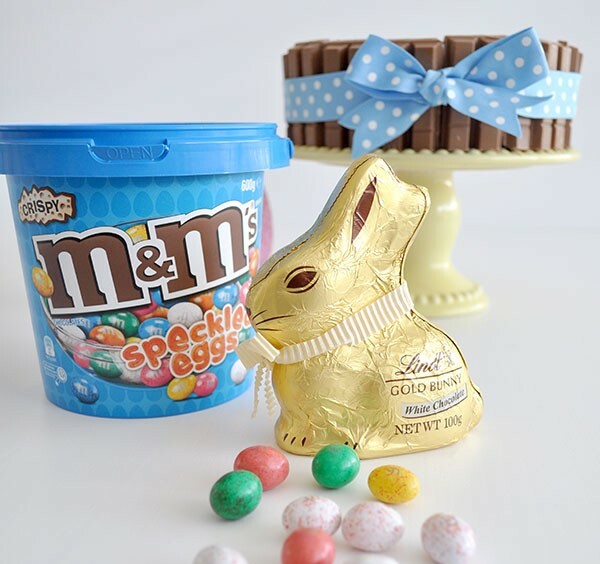 Tie with a decorative ribbon then place chocolate easter bunny on top with some speckled M&M Eggs. I thought I picked up a Milk Chocolate Bunny, but I got the white bunny, it still looks good on top of the cake! I just love how this cake came together; it would make a beautiful centerpiece to your Easter Table (don’t leave it there too long as it might melt!!). Need a meal plan idea for Good Friday? Here are some great recipes you may enjoy for Good Friday, the recipes can be found in the latest Coles Magazine found in store and online or find recipes on the taste.com.au website where you can easily add all ingredients to your Coles Shopping Cart with the simple click of one button, then get them delivered to your door. View Coles Magazine online here. 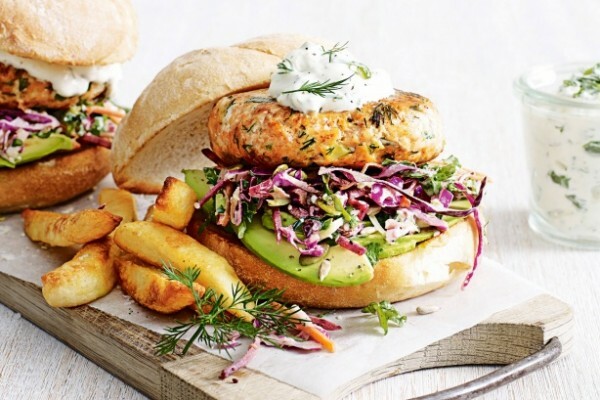 Salmon & Dill Burgers, served with coleslaw and potato chips view recipe here. Now this is chocolate heaven. 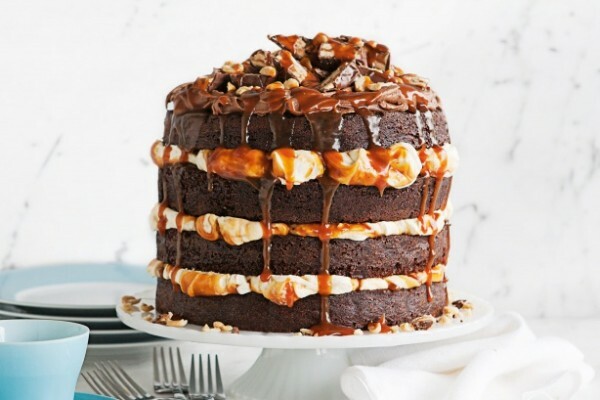 Chocolate Snickers Cake, layers of caramel cream, with chocolate ganache, chunks of snickers bar and drizzles of caramel sauce. View recipe here. 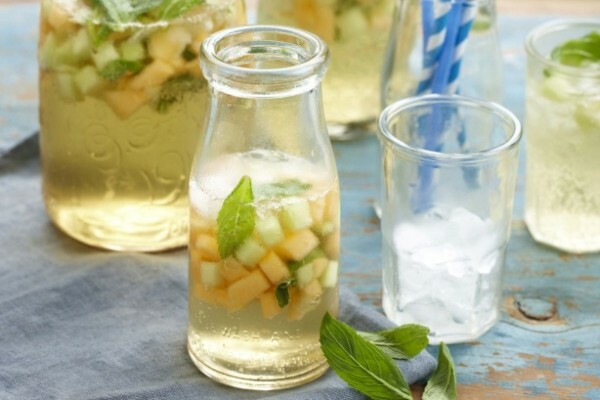 A refreshing Sparkling apple punch with fresh mint and melon pieces, see recipe here. What is your favourite Good Friday recipe? Great cake, I have made a few variations before, a good tip is to plan ahead and buy your chocolate in the weeks before when they come on sale. Buying it all in one go can be quite surprising! That is a good idea, the cakes too can last in the fridge for 2 weeks or so. WOW!! This is so easy and yet it looks like you’ve spent hours making it. 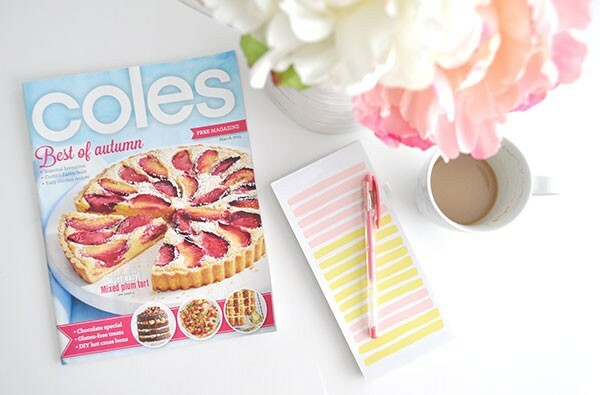 I love the Coles magazine – I’m always grabbing it for easy dinner ideas! There is some really delicous meal ideas in the magazine this month Lucy, I’ve got the chicken pie tagged to make soon! You are one special lady! I might not get to liking or sharing your contents but I do love your suggestions and recipes. I am in the 70+ year age group and pass on your wonderful hints to my daughters when I think they have the time to participate. 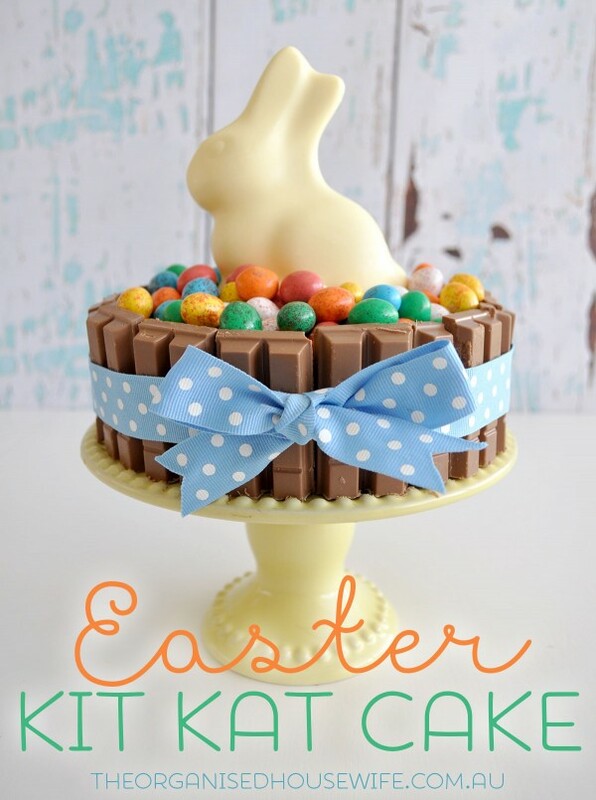 I love the Easter kit Kat cake. I’m always looking for fun and easy projects to make with my 5 year old daughter. 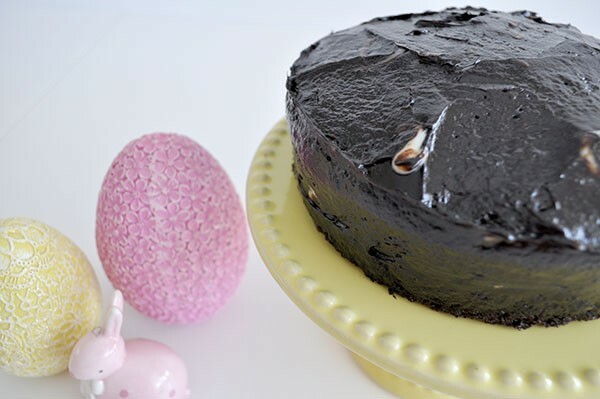 This cake will make the perfect mommy daughter project to add to our Easter this year! Oh my goodness, I don’t think I can choose between the cheesecake, kit kat cake and snickers cake! Too much yum! Great cake idea! My favourite Good Friday is soup (spicy lentil, pumpkin or creamy vegetable) with crusty bread for lunch. For dinner I always make a pasta feast – veggie lasagne, spinach & ricotta cannelloni plus baked gnocchi with napoletana sauce. One of my favourite cooking days of the year and even the most staunch meat eaters we know love the spread. Delish! What a great idea – definitely have these ingredients on my shopping list….do you mind me asking where did you get the floral eggs and the little ceramic rabbit…they are so cute.